On the twelfth anniversary of the El Niño (The Infant) inaugural performance at Le Châtelet in Paris, John Adams' nativity oratorio gets its first appearance in front of a Canadian audience. With around two hundred musicians on the Orpheum stage, the work has to be considered epic by anyone’s rationale. 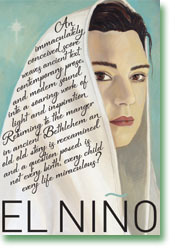 El Niño is a poetic retelling of the birth of Christ, divided into 24 songs. The first half dozen focus on the visitation of the Angel Gabriel to the Virgin Mary, the Annunciation and Mary’s pregnancy through Immaculate Conception. The latter sections chronicle events after The Holy Family leave Bethlehem, such as Herod's slaughter of the innocents. Biblical certitudes are delineated through gnostic texts. However, much of the remaining libretto is taken from Christian Apocrypha, extracts from the Wakefield Mystery Plays and even Spanish poems by Rosario Castellanos. While these are beautifully sung in Spanish, there are passages where the text doesn’t quite fit the music. This is conspicuously obvious in Se Habla de Gabriel. The chorus work was superb – at times, even breathtaking. The level of playing and singing was consistently high throughout, yet despite some impressively dramatic parts, there seems to be an emotional void. Adams' heavily detailed score is evidently not appreciated by everyone. Looking around the Orpheum after the intermission, it was difficult not to notice the additional empty seats. It’s easy to understand why. If people comfortably seated at the beginning were expecting something as accessible as Handel’s Messiah, they were going to be disappointed. El Niño is replete with overlong rhythmic structures that may be difficult to absorb at the first time of hearing. The last song, entitled A Palm Tree, in which the Vancouver Bach Children’s Chorus ushered us into a brave new world, was a sheer delight. Unfortunately, there were fewer people around to enjoy it. VBC president Tony Roper appeared on stage just prior to the start to announce the evening’s performance would be dedicated to the late Diane Loomer, director and founder of Chor Leoni Men's Choir.